This is the best new Life Cereal since Cinnamon Life hit shelves in 1978. In decades following 1978, Quaker has given us Baked Apple Life, Honey Graham Life, Vanilla Yogurt Life and a handful of other varieties. Some where alright. Most were pretty bland. But the one thing they all had in common - they all seemed like limited-edition cereals. They were little more than a temporary change of pace from the core line of Life and Cinnamon Life. Maple & Brown Sugar Life isn't just another spin-off capitalizing on the flavor of the day. This new flavor feels like it was born to be part of Life Cereal. It's a distinct maple flavor that blends as well with milk as it does with the cereal pieces. While brown sugar isn't really noticeable as an identifiable flavor element, this cereal does have burnt brown sugar-esque sweetness that works well to support the maple flavor. I wouldn't be surprised if a few cereal lovers find this cereal to be a tad too sweet. I had my bowl of Maple & Brown Sugar Life 20 minutes ago, and despite having a cup of coffee in the interim, I can still sense a sweet taste from the cereal in my mouth. Some people might like this. Other might not. I don't mind it. It's a little disappointing to see sugar as the second ingredient on the ingredients list. However, this cereal has only 8 grams of sugars per 3/4 cup serving which isn't too bad in the overall scope of breakfast cereals. Speaking of the ingredients list, I wonder if Quaker is trying to hide the sugar's dominance. The list is printed in black type on a dark brown background. I seriously had to take the box and look at it in bright sunlight in order to read it. Other nutritional considerations: each 3/4 cup serving contains 120 calories, 1.5 grams of total fat with 0 saturated fat, 25 grams of carbs (with only 2 grams of dietary fiber) and 3 grams of protein. The first ingredient listed is whole grain oat flour. Overall, I really enjoyed this cereal. My prediction is that Maple & Brown Sugar Life will be around for a long time. What do you think of Maple & Brown Sugar Life? How come I can't find this cereal in any store? It's my all time favorite. Delicious cereal! Wish they would start making it again. No other cereal in the store taste as good as this one. Please? Was an awesome cereal. But I'm mad at the Quaker company that I can't get it anymore. This was the best cereal! I bought this weekly - sometimes 2 boxes at a time - and now there is none. Why is it when something is really good it is discontinued. They need to bring this cereal back. I really miss it. I haven't found any cereal that compares to Life Maple & Brown Sugar cereal. Thoroughly disgusted to find this cereal has been discontinued. It has been a family favorite since day 1. Just got done talking to Quaker and they have discontinued their Maple Brown Sugar Life Cereal. Everyone needs to get on the Quaker site and let them know how disappointed you are with their decision. Life maple and brown sugar cereal is my favorite cereal. But I can't buy it anymore at WalMart. Please tell me where I can buy it. The other stores around me do not sell it. Please let me know. I'm in Hanover, PA.
Best cereal on the planet! Reminds me of the old time Buc-Wheats cereal. Different base (oats versus wheat) but reminiscent. This is the best cereal. Smells great when you open the box. I can eat this every day. Paid $3.00 at Wal-Mart. I have to order this online - can't find it in any stores anymore. I don't understand, it's so tasty! What is wrong with people? Life is one of my favorite cereals, and the cinnamon just adds to it. I like it a lot, and wouldn't mind eating it everyday! By far, this is my favorite cereal. It's so good. You guys don't know diddly-squat about this maple brown sugar cereal. I eat three or five boxes a week it is the gosh darn best. 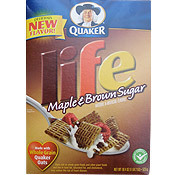 I've always loved regular LIFE cereal, but the Maple & Brown Sugar is the BEST CEREAL EVER!!! I'm so sad that I can't find it at many stores anymore, but I found it on sale at Von's for only $1.99 (reg $4.39 there), so I grabbed 10 boxes! I am worried they will discontinue making it (as it seems happens to so many of my fav products), so hopefully more people will try it and realize that it is THE tastiest cereal on the planet, and relatively healthy and low sugar as mentioned, compared to other "healthy cereals". One of my favorites! I eat it every day... I really hope Quaker will come out with more flavors as great as this one! It tastes exactly like maple and brown sugar oatmeal!! Makes sense I suppose. Haha. Kinda weird, but good. Oh no you didn't! This is manna. 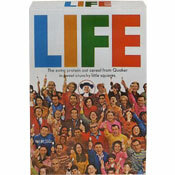 My favorite cereal was Original Life. I wasn't even a fan of Cinnamon Life, but THIS!! I am definitely in withdrawals now that I live in Budapest, Hungary and have even resorted to begging family to send it over to me. Sad, but a necessity. The maply goodness combined with the not too sweet brown sugar is a genius combination. Delicious! I tend to judge a cereal by how much I look forward to eating it. When I go to bed actually anxious to wake up in the morning and eat a bowlful, then I know it's a keeper. That's exactly how I reacted to this cereal! upon opening the bag, the strong smell of maple syrup came wafting out. When eating this cereal, the smell continues to be delicious, and the taste is definitely maple-like without being overly sweet. All in all, an amazing new develop from Life that I would recommend to anyone! I can't wait to get another box.